Justice Maria Lourdes P. A. Sereno has been named as the new Chief Justice. (UPDATE) The Philippines has a new Chief Justice. Supreme Court Associate Justice Maria Lourdes Sereno makes history as the first woman to be appointed head of the judiciary. President Benigno "Noynoy" Aquino III on Friday named Sereno as the 24th Chief Justice of the Supreme Court, months after ex-Chief Justice Renato Corona was removed from his post by an impeachment court. “In the midst of this period of deep mourning for the loss of Interior and Local Government Secretary Jesse Robredo, the President is cognizant of his constitutional duty to appoint the next Chief Justice of the Philippines. He has therefore decided to appoint Associate Justice Maria Lourdes Punzalan Aranal-Sereno as the 24th Chief Justice of the Supreme Court,” Presidential spokesperson Edwin Lacierda said in a statement Friday. Sereno bested other five Supreme Court "insiders" who were on the JBC shortlist submitted to Aquino such as acting Chief Justice Antonio Carpio (7 votes) as well as Associate Justices Roberto Abad (6 votes), Arturo Brion (6 votes), and Teresita Leonardo-De Castro (5 votes). Sereno, 52, is the second youngest to be appointed as Chief Justice and will have 18 years before reaching the mandatory retirement age. This means she will potentially have the longest term in recent Supreme Court history. She will also be serving alongside four Presidents: Aquino and the winners of the 2016, 2022, and 2028 national elections. “The President is confident that Chief Justice Sereno will lead the judiciary in undertaking much-needed reforms. We believe the Judicial Branch of government has a historic opportunity to restore our people’s confidence in the judicial system,” Lacierda added. Sereno was among the witnesses that the House prosecution panel wanted to testify at the impeachment trial of ex-chief justice Renato Corona. Bayan Muna Rep. Neri Colmenares, a member of the prosecution panel, had invited Sereno to testify but prosecutors ended their presentation of evidence before she could respond. Sereno said this superseded prosecution's invitation. Justice Secretary Leila De Lima, who did testify, quoted from Sereno's dissenting opinion on a decision to allow Pampanga Rep. Gloria Macapagal-Arroyo to leave the country. According to Sereno's dissenting opinion, "Corona sent in his own handwritten corrections on the typewritten draft Resolution from Justice (Prebitero, Jr.) Velasco with the instruction that the Chief Justice’s version is to be immediately promulgated." Prosecutors said this showed irregularities in how the temporary restraining order on a government barring foreign travel for Arroyo was issued. Senate President Juan Ponce Enrile ruled that De Lima was not present during SC deliberations on the TRO, so her testimony on that was hearsay. In April, Sereno was among the justices who voted against having the Department of Agrarian Reform pay for Cojuangco-owned Hacienda Luisita based on 1989 rates. The Cojuangcos had been asking for compensation based on the current land value, around P1 million per hectare, or around P5 billion, from the government. 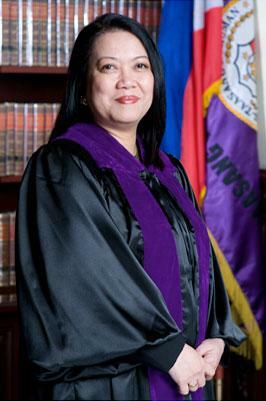 Sereno was co-counsel with Justice Florentino Feliciano on the Fraport case before the International Centre for the Settlement of Investment Disputes and in the Philippine Air Terminals Company, Inc. (PIATCO) before the International Chamber of Commerce-International Court of Arbitration in Singapore. The Republic of the Philippines won both cases. Sereno has a Master of Laws degree from the University of Michigan Law School, a Bachelor of Laws class degree from the University of the Philippines College of Law, where she was class valedictorian, and an Economics degree from Ateneo de Manila University.